Today I’m answering one of the most important questions I’ve ever been asked in the Strength & Conditioning realm. It’s from Mike, and is in reference to lower body strength ratios for structural balance. Great question! I think that this is one of the most important questions that I’ve ever been asked, and is something that I’ve thought long and hard about over the last couple of years. I’ve never been a big fan of hamstring : quadricep strength ratios. First, the ratio changes depending on the speed of execution and the type of contraction, which is often overlooked. And second, neither measure takes into account hip extension strength. An athlete could “appear” healthy based on his or her quadricep : hamstring strength ratio which measures knee extension and knee flexion strength, yet they could have totally weak, atrophied, and/or dysfunctional glutes which would predispose them to spinal, patellofemoral, and anterior hip pain, not to mention ACL tears, hamstring strains, and groin strains. I could mention more potential injuries associated with weak glutes, as truly any synergist of hip extension, hip abduction, and hip external rotation would be at risk, as would any joint that had to compensate for lack of motion that should be provided by the gluteal engine and any link up or down the chain influenced by “serial distortion patterns” caused by said weak glutes. The efficacy of the quad : ham ratio has been debated in the past. Holcomb et al. (2007) developed a more “functional ratio” which compared eccentric (lengthening) hamstring strength to concentric (shortening) quadricep strength, and proposed that a ratio of 1.0 or higher could reduce the likelihood of ACL injury. However, to be honest I’ve never in my training or coaching career given a flying crap about these ratios. 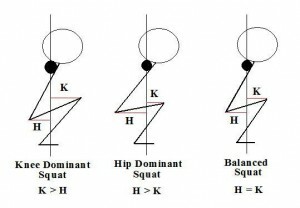 What I’ve always been concerned with is looking at whether an athlete exhibits quad dominant or hip dominant behavior in the weight room and on the field. 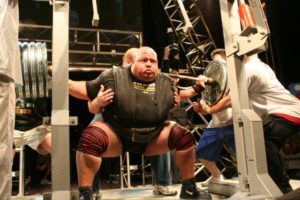 While I outlined some of the behaviors in this Wannabebig article, basically I look at the lifter’s natural Biomechanical tendencies. Today’s athletes, even one’s trained by strength coaches employing popular methods, are almost always still “quad dominant.” I almost always find myself “fixing” athlete’s quad-dominant tendencies. What’s ironic is that I do many of the things that today’s coaches mistakenly believe is dangerous. I teach them how to sit back in a box squat and deadlift. I get rid of any anterior weight shifting. I replace trap bar deadlifting with straight bar deadlfting. I prescribe tons of posterior chain work in the form of hip thrusts, back extensions, and glute ham raises. I’m not afraid to use machines such as the lever squat or reverse hyper pendulum. I train their posterior chains four times per week. I teach them how to prevent valgus collapse (knee caving) and how to stabilize their femurs during unilateral lower body exercises. While frontal and transverse plane stability is extremely important, so is sagittal plane power. Rephrased in load vector terminology, they need to be able to prevent, decelerate, and produce torsional, lateromedial, axial, and anteroposterior movement with their glutes. I get them to really feel the glutes contracting powerfully during various movements. Magically, any knee or back pain goes away. This fact is often overlooked by medical doctors and Physical therapists, and even many coaches: Being weak is dangerous! Weak glutes are the most dangerous risk-factor in all of athletics. Full range strength (more specifically glute strength) with good form cures many of the musculoskeletal problems that ail various athletes. I’ve “fixed” many athletes that doctors and PT’s couldn’t fix. This is because I’m better-versed in plain old strength training. To help his back pain, my old trainer at Lifts had seen a doctor, a physical therapist, and a chiropractor…to no avail. He had been to the Emergency Room several times within a couple month period and was scheduled to have spinal surgery. I convinced him to let me train him, and within two weeks his back pain vanished and has never resurfaced. This was over 3 years ago and he still performs heavy squats and deadlifts week in, week out. This is truly a remarkable story and one that many of my colleagues can relate to. Almost all of my strength coach friends and personal trainer friends who are savvy in developing posterior chain strength have similar stories. When I wrote my glute eBook a year and a half ago, I suggested that one should be able to hip thrust more than they can squat, and deadlift more than they can hip thrust. Obviously this applies to raw lifting as geared lifting gives the squat a tremendous advantage due to the elastic recoil in the squat suits and briefs. Since then I’ve changed my mind. I now believe that all athletes should be able to hip thrust as much or more than they can deadlift, and deadlift more than they can full squat. The three lifts involved in my “screen” – the full squat, deadlift, and hip thrust, all take into account hip extension strength, but they’re different lifts. The full squat is an axial-loaded, quad dominant hip extension exercise that involves significant knee extension. The deadlift is an axial-loaded, hamstring dominant hip extension exercise that doesn’t involve as much knee extension. And the hip thrust is an anteroposterior-loaded, glute dominant exercise that keeps the knee bent. Basically, the posterior chain needs to be stronger than the quads, the glutes and hamstrings need to be functioning properly, and good form needs to be utilized on all three lifts. This means balanced load-distribution between the hips and knees during squatting and deadlifting, and controlling the weight all the way into locking out of the hip thrust. To give you an example, my client Steve can hip thrust 625 lbs, sumo deadlift 500 lbs, and full squat 385 lbs. Right now I’m able to hip thrust 565 lbs, sumo deadlift 565 lbs, and full squat 345 lbs. Shorter guys will typically hip thrust, deadlift, and squat a similar amount of weight, as they’re often better at squatting yet worse at deadlifting and hip thrusting. A shorter athlete might hip thrust 405 lbs, deadlift 405 lbs, and squat 405 lbs. I’ve found that the longer I train athletes, the stronger their posterior chains become and a larger gap forms between posterior chain and quad strength. I should also mention that I prefer the conventional deadlift to the sumo deadlift for most athletes. Some strength coaches haven’t yet caught on to the hip thrust. Others do them but don’t go heavy enough. I can tell you that just this year alone three of my clients who suffered from back pain when they came to me saw complete elimination of pain after two months on my system. I can also tell you that every client I’ve trained in the past four years (probably 300 clients) has become very proficient in hip thrusting, and no one has ever hurt themselves by performing the movement. I’ve had 60 year old ladies doing 95 lb hip thrusts for 2 sets of 10 reps. I believe that this rule (along with good lifting mechanics on all lifts) is the secret or “Holy Grail” to knee, spine, and hip health and should be a golden rule in the strength & conditioning profession. I hope that the day comes soon where more coaches hop on board. This rule maximizes structural balance and injury prevention and allows for the development of maximum performance, which all athletes deserve. The post ABC (Ask Bret Contreras) – Glute, Ham, Quad Strength Ratios appeared first on Bret Contreras.